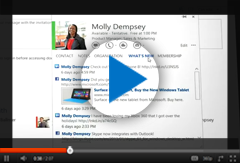 Instant messaging, voice, phone and real time video conferencing with Microsoft Lync. Chat, have voice or video calls. Start meetings in one click. Microsoft Lync is an instant messaging and conferencing communication platform, designed to fulfill the needs of every business. 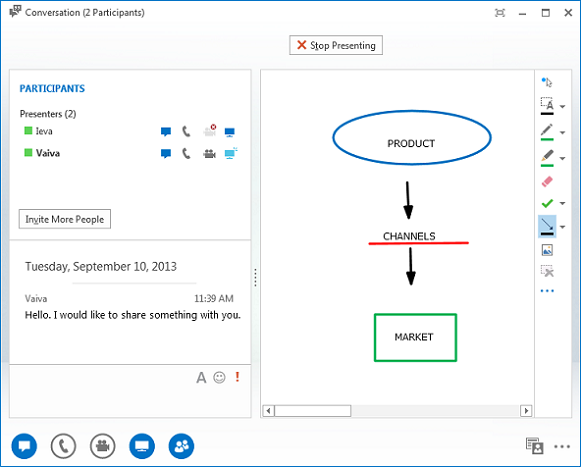 With Lync you can chat, have voice, video, Skype and phone calls, invite people to web conferences. Schedule a meeting in advance, accept invitation to take part in one or simply start a meeting in one click. Microsoft Lync allows its users to save time and resources by giving possibility to chat and talk not only with Microsoft Lync users, but with people who use Windows Live and Skype as well. Lync can be integrated in the existing office phone system PBX. See the availability of people on a dial and handle calls in a more convenient way. 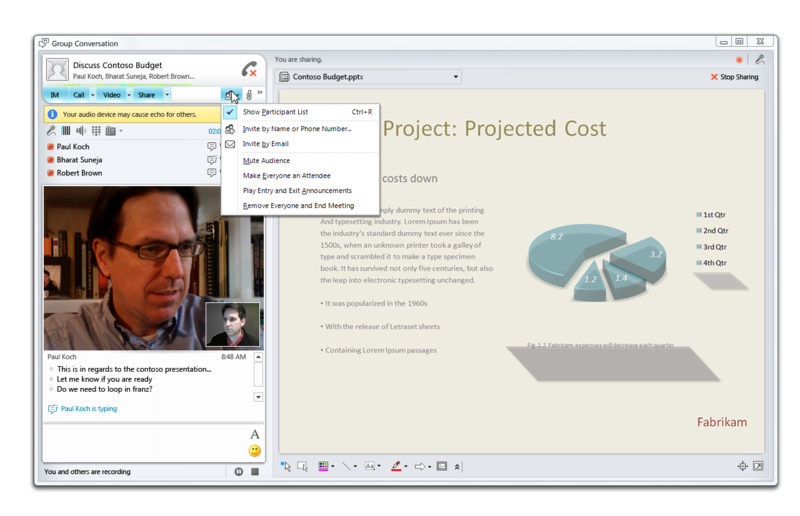 With Lync, up to 250 people can take part in one web conference. Have a real conference with people from around the world. Set the speaker, and have him presenting a project to other people by using all the features Lync has. Save time and money for traveling with Microsoft Lync real time experience. Record the conference and post it on your team or public website. With OneNote Share you can create meeting notes directly to OneNote within the Lync Meeting. Use it to make sure nothing is missed, or to avoid mistakes. Microsoft Lync saves and archives the chat history, which is always available online and in your Microsoft Outlook. Access your chat history even if you are away from your desktop on the web. Voice meetings can be recorded - rewind and make sure nothing is missing after the meeting. Share your desktop, PowerPoint slides, virtual whiteboard online during video and audio meetings. Save on alternative to remote desktop. With Microsoft Lync, users are able to share desktop, programs, workspaces and files with other people who are taking part in the Lync Meeting. You can share whiteboard to add images, content, spreadsheets. Use the tools to mark, highlight or even comment on the content. Save the whiteboard on your desktop and access it with all the comments after the meeting. The program sharing allows appointing a presenter, who can take lead of the meeting or edit documents, for example a Word document or an Excel spreadsheet. Microsoft Lync also allows sharing PowerPoint presentations for more efficient work and speakers convenience. Record the conference and upload it to your website or teamsite. Share your Desktop to show the meeting participants’ important data. Create polls and let people vote on the spot. Empower your meetings with Microsoft Lync sharing features - use custom settings to manage other people’s permissions to collaborate in relation to the shared documents. Save your money with Lync. You do not need to pay additionally for remote desktop software like TeamViewer, Logmein, GoToMyPC or Citrix to be able to share or edit files during online meetings - all these features are included in Microsoft Lync. 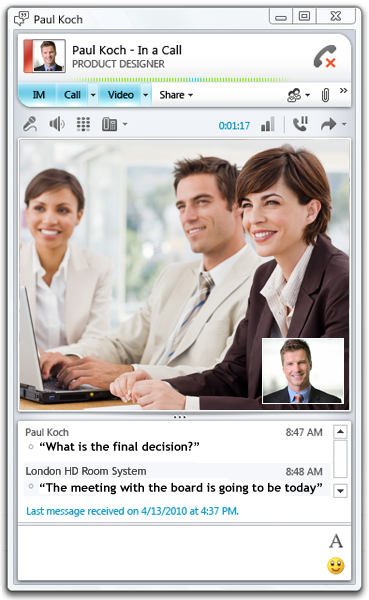 Access conferencing features from the web. Get in contact with people who do not have Microsoft Lync. Having Microsoft Lync installed on your mobile device, allows you to chat or start a meeting anywhere you are. Set up Lync on your tablet or a smartphone and stay reachable for your colleagues even if you are on the go. You can still schedule or start meetings in one tap, invite people to have a meeting, or join one yourself. Microsoft Lync Online, allows you to use most of Lync features on the web. In case you do not have your tablet or smartphone with you, all you need is a web enabled device to access your Office 365 account via browser. Chat and join Lync Meetings on the Web. Add phone numbers to your contacts and call them directly from Microsoft Lync. Microsoft Lync also allows adding contacts of people using Microsoft Lync outside of your company, Windows Live, Yahoo! messenger, AOL Instant messenger, Google Voice and Skype. Need to have a meeting with a client, who does not use any of these services? Microsoft has resolved that with a perfect sense: invite people, who do not have Office 365 account, to have a meeting by sending invitations to their e-mails. They will be able to join the Lync Meeting via Internet browser by clicking on the link they receive in their mailbox. See availability status. Add your colleagues to Lync from suggested contacts. Microsoft Lync easily finds contacts of people from your company that have Office 365 accounts - just start typing names of your colleagues and Lync will suggest them to you. No need to search for people among global contacts and wonder if it is really the person you are looking for. Have all the people you contact the most one click away. Got an urgent question for a colleague that is not around? Just send an instant message and start a live chat. Add or remove people to/from the chat, share files, screens, programs - use all the features of Lync to get the best results. See the status of your co-workers, get notified when a particular person becomes available. Lync will recognize the device that is currently used and it will be displayed next to your status. 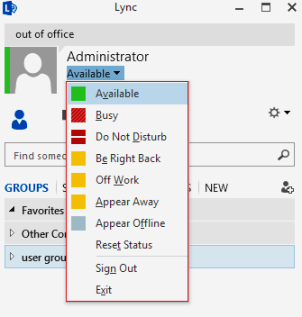 Your Lync status will be updated automatically according to your Microsoft Outlook Calendar, so your colleagues will always see if you are available, on a meeting or your working hours are over. Change your status manually and avoid being disturbed when you are busy working.